(1) The cell growth of E.coli DH5α follow logistic growth kinetics with an assigned growth constant µ. (2) For simplicity decay of all products follows first-order kinetics. (3) All promoters have the same activity resulting in a constant transcription rate. (4 ) The rate of translation is considered to be equal yet the degradation rate of proteins differs. (5 )AHL transport is only restricted by diffusion through the cell membrane following the concentration gradient, AHLout > AHLin. (6) Binding and dissociation constants of AHL and luxR are based on mass-action kinetics. (7) The enzymatic activity of LuxI within the fusion protein is not decreased by the fusion event. In a first simple model a single cell and its kinetics in output will be analyzed. 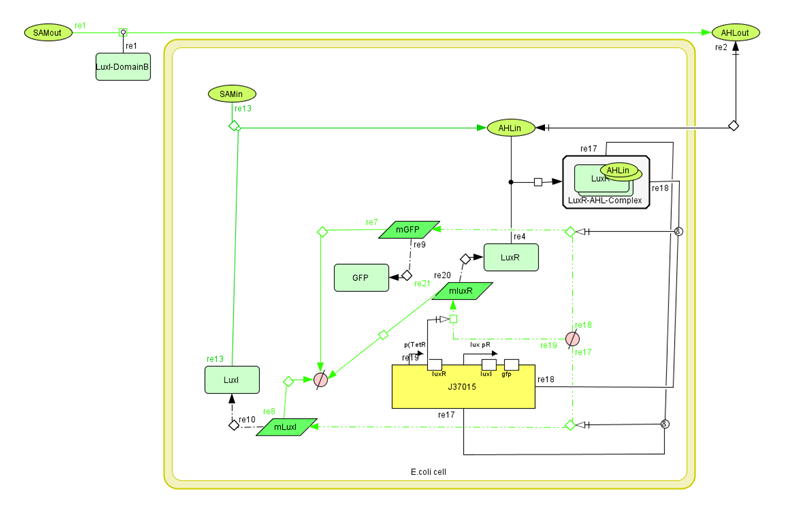 The major input in this simplified scenario is AHL produced from SAM catalyzed by LuxI. The direct output is GFP or any other fluorescent reporter like RFP and YFP. In the gene design it can be seen that GFP expression is coupled to its induction upon binding of LuxR-AHL complex to the luxR promoter. Next, AHL has to be transported across the membrane of the cell via diffusion. The inside concentration is therefore determined by the diffusion rate across the membrane (kdif), the initial concentration (AHLex) as well as the decay constant of AHL inside the cell (kAHL). Furthermore AHL as well as constitutively expressed LuxR form a complex which can bind to the luxR promoter. The amount of AHL-LuxR complex binding the luxR promoter is dependent on the concentration of AHL, the concentration of LuxR and its degradation (kLuxR) the binding and dissociation constant of AHL and LuxR (kdis=. A signal can be detected using different reporters like fluorescent proteins, pigments or substances that can be detected. We focused on the detection using fluorescent proteins like GFP which could be detected using absorbance measurements. 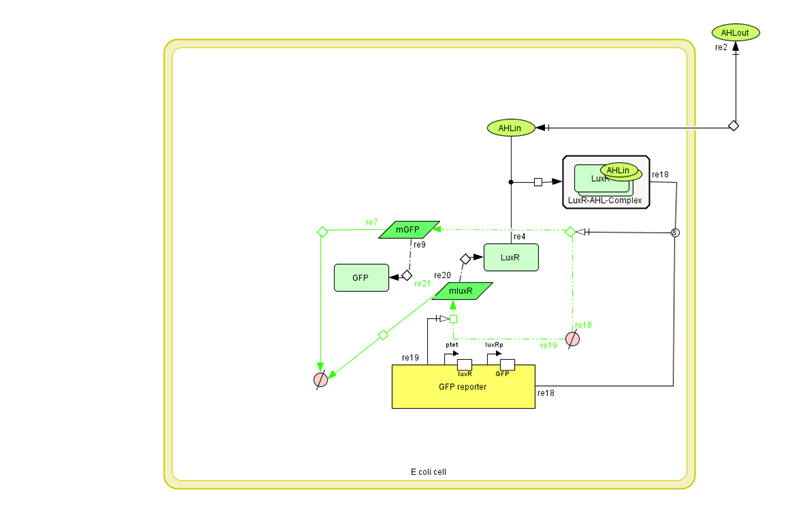 In this easy model the kinetics of GFP as output signal will be displayed. The formula displays GFP expression over time G(t). The term X(t) refers to the mRNA production and degradation as well as fluorescent read out obtained in RFU, composed of kt x M, where kt is an unknown constant and M is mRNA production remaining constant for all proteins expressed in our model. The Term γ stands for dilution rate which can also be represented by the growth rate µ of the E.coli Dh5α. The half life of GFP was experimentally determined to be around 24 hours. Therefore the value of γ is about 0.029 h-1 and can be neglected as it is so much smaller than dilution rate. For the simulation first the model of a growing culture with direct AHL input and GFP output was analyzed. The three graphs shown below demonstrate the behavior of the gene construct upon AHL induction. The higher the concentration of AHL used for the induction the higher is also the fluorescence signal detected from GFP. 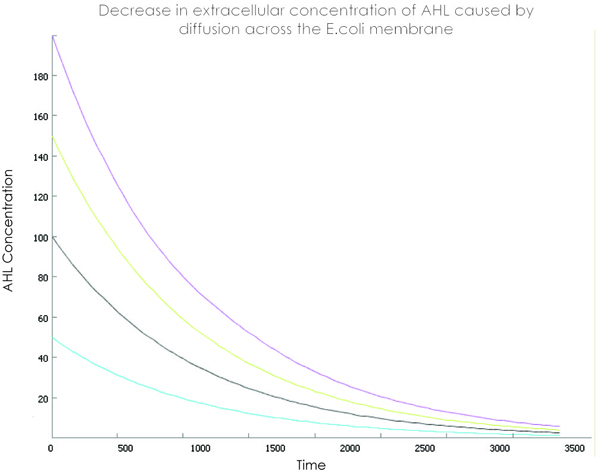 AHL diffuses basically without any constriction into the bacteria clearly depicted by the exponentially following decay of the graphs (Figure 1). Correspondingly the endpoint fluorescent signals of GFP vary depending on the AHL input which can be seen in Figure 2. 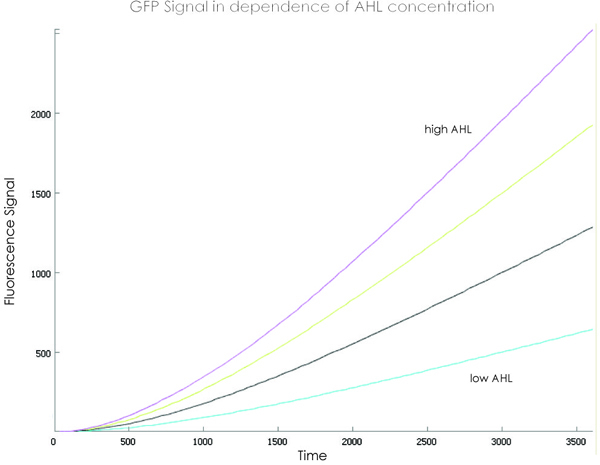 For high AHL concentrations the endpoint GFP signal is elevated compared to lower AHL concentrations. 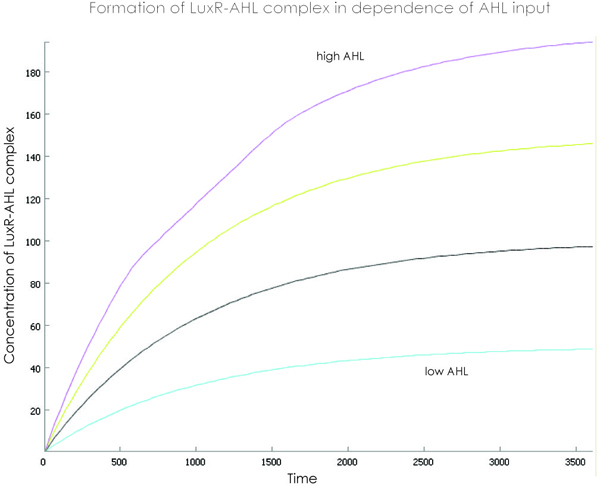 In Figure 3 the LuxR-AHL complex formation is displayed which also increases in endpoint value for increased AHL concentrations caused by the availability of binding partner. Even this simplified model shows that the output GFP signal can be used to quantify the amount of AHL present in the sample. This will allow us in the future to accurately determine the amount of cancer cells present in the patient’s blood sample. Using amplification constructs like introducing LuxI downstream of the Lux pR together with a reporter protein even more AHL will be produced. The set-up can be seen in Figure 4.